50+ World > History & Headlines > 1945 > Were You Alive in May 1945? On May 1, 1945, a German radio station broke the news to the world that Adolf Hitler and Eva Braun were dead; they had committed suicide the day before. Four days later, U.S. troops liberated the Mauthausen concentration camp in Germany, nearing the end of German involvement in World War II. On May 8, 1945 the Allies accepted Germany's unconditional surrender and British Prime Minister Winston Churchill (by then a 70-year-old septuagenarian senior citizen) announced Victory in Europe (VE) Day. Senior citizens today will remember WW II VE Day celebrations that took place across Europe, Canada, and the United States. 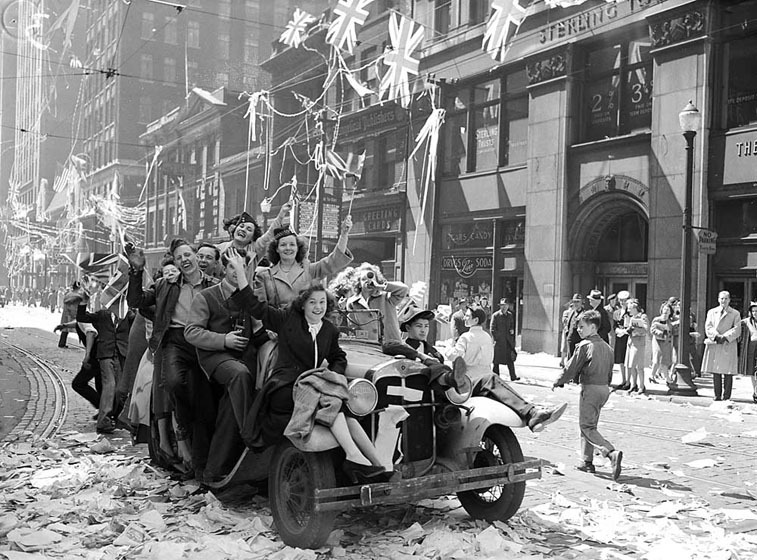 Below, V-E Day Celebrations on Bay Street in Toronto, Canada on May 7 1945. In Halifax and Dartmouth, Nova Scotia the city populations had nearly doubled during World War II from military personnel stationed there. Overcrowding had strained relations between residents and the military. The VE day celebrations turned into a riot in Halifax and Dartmouth, Nova Scotia by civilians and many of the 25,000 troops stationed in situ. Looting of liquor and beer stores and vandalism caused damage to over 500 businesses in Halifax and Dartmouth, and 3 rioters died. Les Brown's songs My Dreams Are Getting Better all the Time and Sentimental Journey are topping the US Song charts in May 1945. Below, a video time capsule montage set to Sentimental Journey with Les Brown & orchestra, sung by Doris Day.